Cream the butter and sugar together; add baking powder and nutmeg and mix well with electric mixer. Add eggs and vanilla and continue to beat at medium speed until light and fluffy. Stir in flour just until moist; fold in nuts taking care to not over mix. Cover the bowl with plastic wrap or damp cloth and refrigerate for 1 hour. Shape dough into 1 inch balls, flatten slightly with bottom of small glass. Or use dough and cutout shapes. Place 4 inches apart on prepared cookie sheets and bake 10 to 12 minutes or until set. Fill footed mug or any mug with hot water to preheat it, then empty. Pour piping hot coffee into warmed glass until it is about 3/4 full. Add the brown sugar and stir until completely dissolved. Blend in Irish whiskey. Top with whipped heavy cream. Serve hot. Hot Coffee's with a KICK! Always ahead of the game... :) Love the St. Patty's Day treats! It wasn't until just recently that I visited The Buena Vista in SF where I had my very first Irish coffee and loved it, I can't wait to try yours out. Love the Irish coffee, prefer JJ Jamison's for the Irish whiskey! All of my uncles (paternal) drank Jamison's. And the cookies, well they are just beautiful Claudia! What a beautiful combination! I love the pistachio cookies. They look so pretty and delicious. Bet they are very crunchy. @daydreamer thanks hope you like it! @redkathy never can get enough good strong coffee with whiskey,love it will have to try that kind! I could use a cup of that right about now, and the cookies are wonderful! I'm really enjoying your blog! Decided to become a google follower. Love your tribute to the Irish with this post. I only recently realized that I absolutely love pistachios! Just posted a recipe for a wonderful baklava that has lots of them! Cheers! I am ready for St. Patrick's Day in all ways except for food. meaning - I haven't thought about it all. Your goreous duo was just the reminder I needed. Aw I know my students would love these cute cookies! Do you make irish soda bread too? The cookies look yummy but I could really use a cup of that coffee about now! i love pistachio! these look yummy! 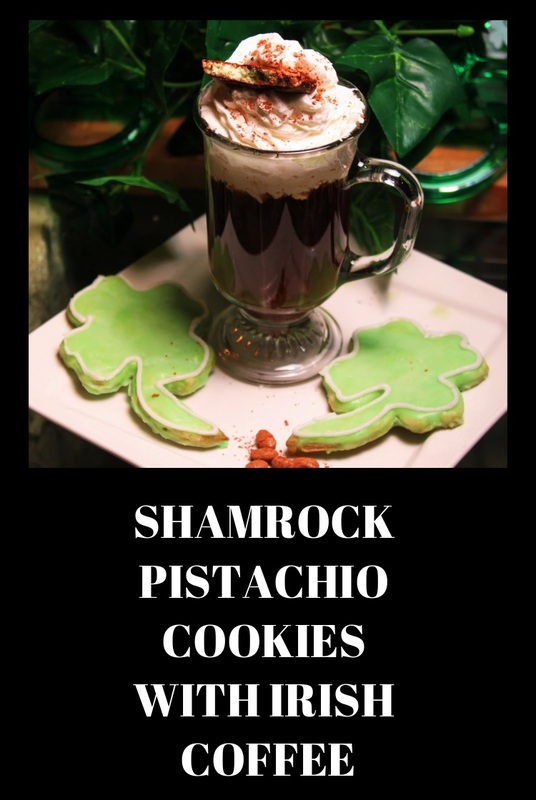 Although I'm not a pistachio fan, I'll say that I could use a sip of that Irish Coffee! Gorgeous clover shaped cookies and I love the pistachio flavor! "Buttery flavored pistachio cookie" and using a cup of pistachios...sound delicious! Wish I had some right now with the Irish Coffee. You are the cookie queen and certainly know how to celebrate St. Patrick's day! Irish coffee reminds of when I was a student and first visited San Francisco, and tried my first Irish coffee...yours looks so good!!! Beautiful shamrocks, and with pistachios... Oh my what a heavenly cookie! I am not a coffee drinker but my wife is addicted. While we were Ireland my wife and her buds drank an Irish Coffee every day. I'll have to give her your recipe as I don't think hers had brown sugar in it. My family loves frosted cookies and these are perfect for St. Patrick's Day!! !